the heated O2 sensor idea might be too hot. I connected it to the 12 volt power source in the car with the meat probe thermometer on the tip of it. It got up to 215F before I stopped. I could hold the body of the sensor in my hand behind the hex end and I could feel some heat radiating off of the sensor. Wether or not it radiates enough to heat the passing air is another unknown. I do not know how much hotter this thing would get. I might experiment with some resistors (if I can find the bag of them I had) and see it I can knock down the voltage and limit the temperature. Tomorrow if I get around to it I will look under the hood carefully to see where I could plumb a preheat carb tube from the exhaust manifold to the air box. 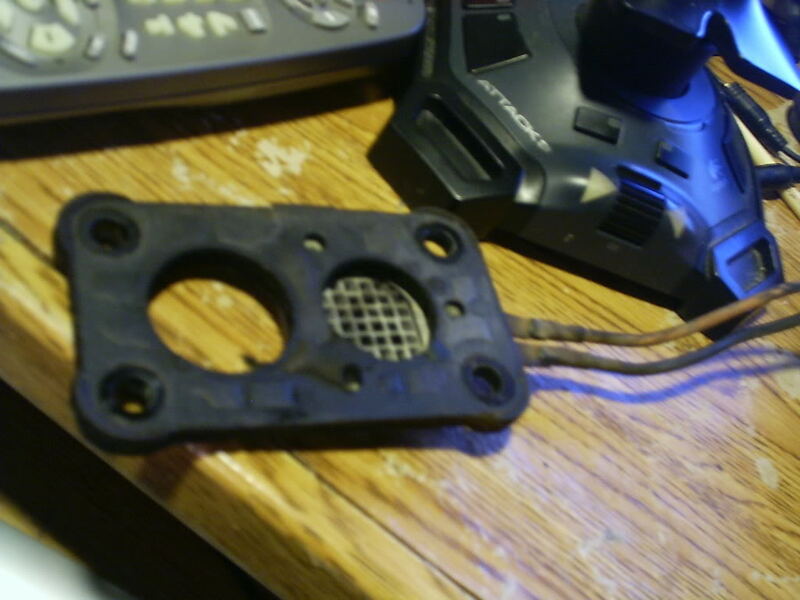 Also will try to fab a bracket to mount the heated O2 with if I can limit the temperature. I figure if I run it off a relay that is switched when the car is running would work. I am not sure if the stock HO2S are heated the entire time the car is running or just until the pcm reaches closed loop mode and doesn't need the heaters any more. If anybody knows about that let me know. If you really have your heart set on an electric heater I think you should make your own with small stainless steel safety wire that you could buy from an aircraft supply such as Aircraft Spruce or Chief Aircraft. When hot wiring Styrofoam a 12 volt supply and 15 feet of .030 wire will give just a few amps and a low heat. The longer the wire and the smaller the diameter the less amps. I am not recommending this but you keep playing around with the heater from an O2 sensor which seems most unlikely to work. You can buy nichrome wire from rocket hobby shops if you want to go a little more application specific. I don't like the electric heater for all the reasons already mentioned. Thanks for sharing the picture of your WAI. I am looking at building one for my vehicle. Were you able to quantify the mpg increase with the WAI by way of a scangage or similar device? Getting old school here. Anybody familiar with the old EFE system GM used to use on some carbbed engines? Early Fuel Evaporation was incorporated on the Camaros and not sure what else. There was a plate below the carb, looked like a TB spacer really, and had a heating element to heat the incoming a/f mix to aid cold weather driveability. yea that "thing" my chevette had one. i took it off tho, dont know if it worked and without it it seemed just fine. must have drew some serious amperage tho(had like 8-10 ga wires on it). was controlled by a temperature switch in the cooling system. That would probably make the engine run as if the EGR were stuck wide open, that is not run at all. EGR flow is very controlled and very precise. Anyone who has had one sticking open will tell you what kind of issues it will cause. matter of fact, that was an old test on the open style ones was to push on the valve while the engine was idling and if it stalled you knew the egr was closing properly. In some Ford applications, there is use of a resitor bank in the HVAC blower motor housing to increase heated air temp.... 12v and all. Call Ford and ask them about it, I bet they're under $30 and are simple to install on any application once you find which peg to give power to as I believe it has a specific connection type. May not be useful for warmup if that's what your going for, but I think a small heater core would make a good airbox mount. I can't remember where I saw, but best idea I saw was to run coolant through the intake. I wish I could remember the source, but just below his carb he ran coolant so that the intake would heat up to the temp of the coolant and any gas from the carb or TBI that didn't vaporize and became a droplet that hit the intake would more readily vaporize. The main thing I'd like to try (but have no idea how to approach it) is to use exhaust heat in someway to heat up an engine faster. Maybe a small radiator is all that's needed and a thermostat that stops flow to this radiator when the coolant temp is above 150F or something. Because I hate how long the car takes to warm up when the exhaust is hot instantly, there's no reason to not just warm up quicker using the heat. I thought about something like a heater core, or even something like baseboard water heaters. They look like a piece of copper pipe with aluminum radiator fins on them. On some Fords, they had a coolant line running thru ports in the throttle body. I think the 5.0L that was in my Mustang about 13 years ago had that setup. I thought it had something to do with the egr system but I do know they used some kind of coolant heat in the TB. BTW, I didn't realize the Chevette ever used one of those heaters. I had two different Chevettes and I don't think either had one.